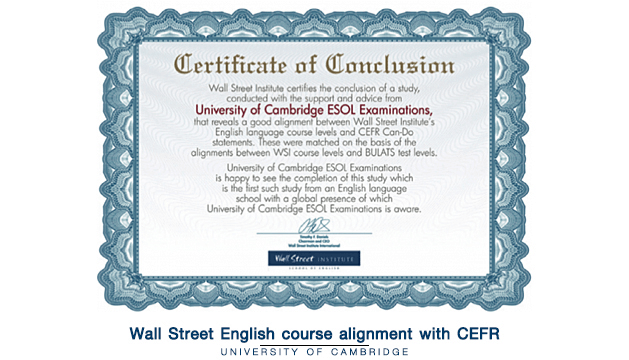 With so many language schools to choose from, why choose Wall Street English? Here are ten reasons why over 3 million students worldwide have chosen Wall Street English. 1.) Where you want, when you want. A great advantage of the Wall Street English course is that you can study wherever you are at any time. Our entertaining interactive lessons are available online via our website or app, using any device. So whenever you have some free time, you can take the opportunity to study English. Moreover, you can book your teacher-led lessons on a day and time that suits you. Everyone has different schedules for learning and different time limits. Thanks to our wide range of levels and clear set of learning objectives, Wall Street English can help you reach precisely the goals you need in the time required. Whether you need to go quickly or slowly, we can adapt to your rhythm. We also give you continual support and guidance if you’re behind or even ahead of schedule. Wall Street English was founded in 1972, and the very first students used the same method we still adopt today. This method is based on the natural acquisition of language, which means listening and copying language in the same way that you learned your native language as a child. Over three million students have successfully learned English with this method and we can guarantee it works. 4.) Focus on the right skills. When we think of language skills we usually refer to reading, writing, listening and speaking. If you consider for a moment which of these skills you use most you will answer listening and speaking. Yet many language courses make students focus a lot of attention on reading and writing. For anyone needing English for work, the typical difficulty is understanding foreigners either on the phone or at a meeting, and being able to speak. At Wall Street English 80% of your lessons are based on these two essential skills, listening and speaking because that’s what you need the most. An important consideration when choosing a course is the type of English you learn. The English you need for work or for traveling is undoubtedly practical English that you use when you speak on the phone, write emails or take part in meetings. The Wall Street English course teaches you the everyday English that people use at work, at restaurants, and on vacation. You will also learn to understand people with different accents from all over the world because the majority of people who use English as a second language communicate with others who are not mother tongue speakers. A fundamental part of learning is having fun. If you enjoy lessons you’re much more likely to remember and absorb what you study. Our interactive lessons are based on a very entertaining series of video stories and various quizzes enable you to practice the new language presented to you. Moreover, every Wall Street English center offers a weekly calendar of conversation lessons with small groups, as well as special monthly events in and out of the center where everyone can get extra practice. Wall Street English has over 400 centers in 28 countries around the world. At present we have 180,000 students. Being such a big organization is a great advantage for you as a student because you will belong to an international community and have the chance to get to know students from the other side of the world. Furthermore, you have the guarantee of the school following international standards and offering high-quality products that are continually updated and improved. At Wall Street English we have a total of 20 levels, from complete beginner to very advanced (almost native speaker) level. Each level helps you learn a series of very specific language skills. This system and course content is in line with the international standard for language levels, the CEFR (Common European Framework Reference). So when you do your initial level test to identify your starting point, you can see where you are on the scale from A1, A2, B1, B2, C1, C2, and decide which level you want to reach. 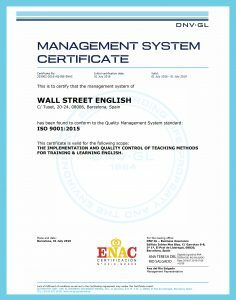 Another great thing about Wall Street English centers is that they give you the chance to prepare for the most well-known international certificates – IELTS, TOEIC, TOEFL, and BULATS. These certificates are becoming increasingly important as universities and companies use them more and more to assess the English level of applicants. Wall Street English can help you reach the required level with our general course, and then help you prepare for the particular exam you need with one of our specialized teachers. Every Wall Street English center is modern, with an open-space style to help all students increase their confidence in speaking English in front of others. We also have a strict English-only policy for everyone in the school, which means from the moment you enter to the moment you leave, it’s like being in an English speaking country. As you can see, there are several excellent reasons to learn English at Wall Street English. Start now by doing our online level test.